Jakarta: Indonesia kicked off one of the world’s biggest one-day elections on Wednesday, pitting President Joko Widodo against ex-general Prabowo Subianto in a race to lead the Muslim-majority nation. 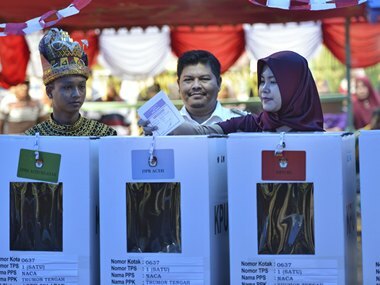 More than 190 million Indonesians are set to cast a ballot as polls opened shortly after 7 am local time in restive Papua. The vote is slated to end at 1 pm in Sumatra at the other end of the volcano-dotted archipelago. Some voters went to their local mosque before casting ballots, as the daily call to prayer sounded across a nation that is nearly 90 percent Muslim. A record 245,000 candidates are running for public office, from the presidency and parliamentary seats to local positions — the first time all are being held on the same day. Opinion polls show Widodo, 57, is a clear favourite — but he faces a tough challenge from Subianto, 67, who has leaned on a fiery nationalist ticket and warned he will challenge the results over voter-list irregularities if he loses. Subianto narrowly lost to Widodo in 2014 elections, and unsuccessfully challenged those results. Voters will flock to more than 800,000 polling stations where they’ll punch holes in ballots — to make clear their candidate choice — and then dip a finger in Muslim-approved halal ink, a measure to prevent double-voting in a graft-riddled country where ballot-buying is rife. The polls present a huge logistical challenge in a country stretching 4,800 kilometres across more than 17,000 islands with a population of more than 260 million, including hundreds of ethnic groups and languages. Officials were moving cardboard ballot boxes by motorbikes, boats and planes — as well as elephants and horses — to reach mountaintop villages and communities deep in the jungle. The poll has been punctuated by bitter mudslinging and a slew of fake news online that threatens to sway millions of undecided voters. Widodo has campaigned on his ambitious drive to build much-needed roads, airports and other infrastructure across Southeast Asia’s largest economy. His choice of conservative cleric Ma’ruf Amin as his running mate has also raised fears about the future of Indonesia’s reputation for moderate Islam. Raised in a bamboo shack in a riverside slum, the soft-spoken Widodo stands in stark contrast to Subianto, whose strongman image is underscored by a penchant for slamming lecterns as he accuses Jakarta of selling the country off to foreign interests. Subianto — joined by running mate Sandiaga Uno, a 49-year-old wealthy financier — has courted Islamic hardliners, promised a boost to military and defence spending and, taking a page from US president Donald Trump, vowed to put “Indonesia first” by reviewing billions of dollars in Chinese investment. Subianto’s long-held presidential ambitions have been dogged by strong ties to the Suharto dictatorship, which collapsed two decades ago, and a chequered past.